Beyond the feasts of food, hectic schedules and family visits, you’ll know the holidays have arrived when you find yourself standing knee-deep in a room filled with crumpled wrapping paper. Americans throw away 83 million tons of paper trash, including tissue paper and cardboard boxes, according to an Environmental Protection Agency study in 2007. Between Thanksgiving and Christmas, the amount of household garbage in the U.S. increases by 25 percent, the EPA’s website states. 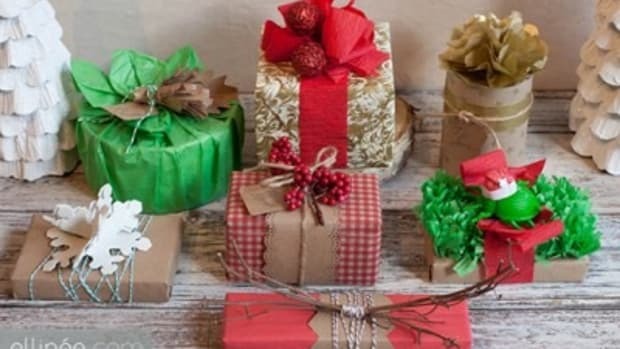 If everyone wrapped three holiday gifts with recycled or reused materials, it would save enough paper to cover 45,000 football fields, according to a Use Less Stuff Report published in 1996. If every family reused just 2 feet of holiday ribbon, the saved ribbon (38,000 miles) could tie a bow around the entire planet, the ULS Report states. While there are some options for 100 percent recycled wrapping paper, you can likely wrap all of the gifts on your list with materials you already have in your home. Choosing the right eco-friendly options can personalize your gift in a way that mass-produced store-bought gift wrap can’t match. 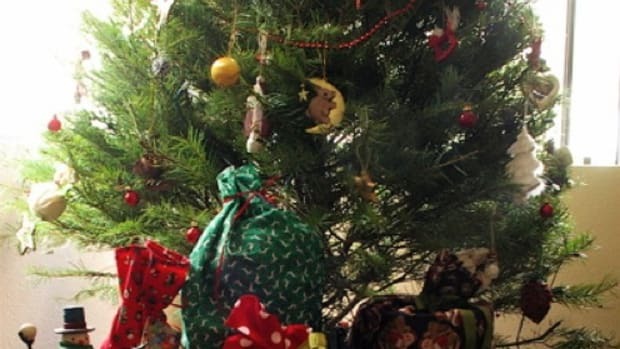 Here are some ideas for wrapping gifts the Earth-friendly way. 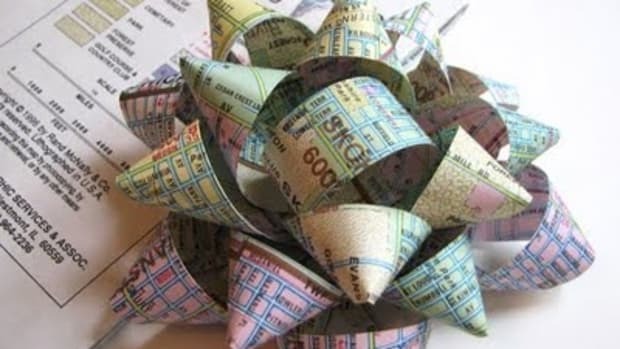 Use a map from a summer -vacation or favorite location to wrap the present. Or pick up some extra maps from your local AAA location. Make a gift tag with some ephemera, such as a brochure, ticket stub or postcard from a recent trip. Incorporate some natural elements such as pine cones, evergreen branches or holly. We used pine cones along with dried sunflowers and sorghum from Roots Cut Flower Farm in Carlisle (for more search on localharvest.org). If you’re using fresh greens that will brown over time, be sure to wrap the present within a few days of giving it. Use a gift bag that can be -easily folded and used again. Or make your own recycled wrapping paper by using a paper bag or the pages from an old book, newspaper or -magazine. Add ribbon, dried flowers or a recycled-paper star to top it off. We used a lunch bag, crumpled to add texture, and dried straw flowers from Roots Cut Flower Farm. Print out sheet music from a website such as www.noelnoelnoel.com. Select a favorite song or a Christmas carol, and print it out on your home printer. Or use any sheet music you might have from the budding musician in your home. To give the paper an antique look, boil a few cups of water and add a tea bag. Allow the tea bag to cool before handling, then brush it across the page like a paintbrush to get a marbled look. For an even color application, allow the cup of tea to cool and pour into a jellyroll pan along with the sheet music pages. Allow to soak for about 30 -minutes, then remove the paper and lay flat to dry. To avoid wrinkles, secure the paper while it dries with an old towel and several books on top. Top the gift with cardstock cut into the shape of a treble clef. Tie a ribbon strung with jingle bells around the gift to add an audible musical element. Use acrylic paint or rubber stamping ink on the end of a pencil eraser to stamp on polka dots. Personalize the top of the gift by -adding a monogram of the recipient’s -initials. Use a word processing program to -create the monogram and then cut it into a circle. Or cut card stock in the shape of the recipient’s first initial. Brush the cardstock with white craft glue and sprinkle with glitter. When the glue dries, shake off the excess glitter and use in place off a bow. Invite some friends to hang out for a group wrapping party. Have everyone bring a light snack to share as well as wrapping supplies, such as gift bags, wrapping paper, tags and tape — and gifts to be wrapped, of course. Prepare the kitchen or dining room table with extra supplies, and be sure to keep any curious family members clear of the “wrapping zone” so no one’s surprises are spoiled. Play some holiday music to inspire a festive mood and chat the night away while you all get your wrapping accomplished. Wrap the top and bottom of a gift box separately so the box can be opened without tearing the paper to unwrap it. 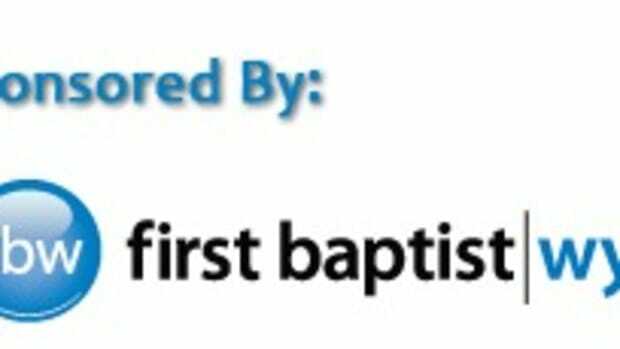 Then encourage the recipient to use the box. Turn last year’s holiday cards into gift tags by cutting out a section of the card and gluing it to card stock. Use just the right amount of wrapping paper by measuring first to avoid bulky corners. You’ll conserve paper and have crisp corners. Use fabric ribbons instead of paper curling ribbon. It makes for a lovely presentation and gives you the satisfaction of opening something even if you’re not tearing the paper into shreds. Plus, fabric ribbons are much easier to untie and reuse. Green American Today offers 10 tips on how to plan ahead and reduce your waste during the holidays.